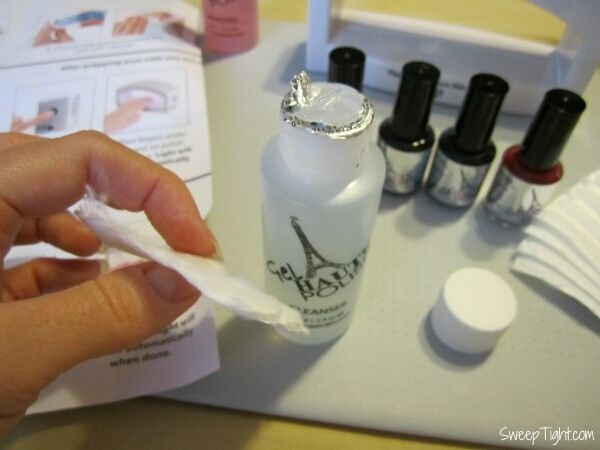 Gel Haute Polish Kit is a new way to get fabulous gel nails at home. 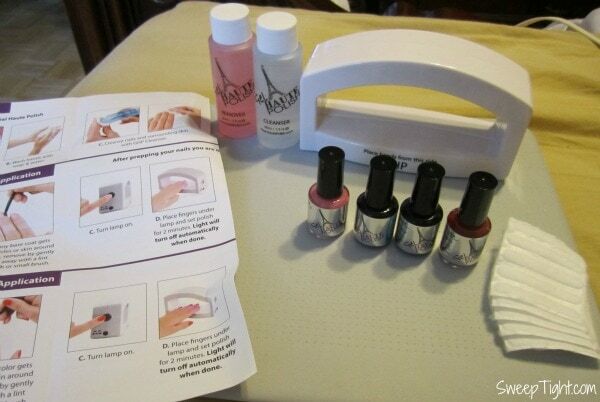 This kit is easy, affordable and so much fun to give yourself quality manicures in the comfort of your own home. The elite kit has everything you need to get long lasting, chip free polish! Product was received for review, and this post contains affiliate links. I used to get my nails done in a salon years ago. I stopped going a long time ago because it’s just too pricey and time consuming. 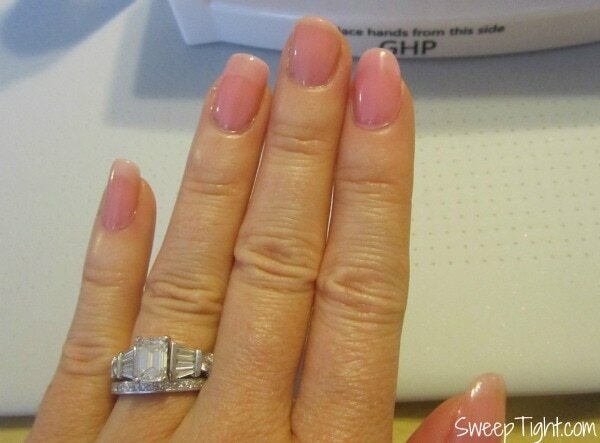 However, getting them done professionally used to always last a lot longer than doing them myself at home. That is not the case anymore! The first thing that I love about the Gel Haute Polish Elite Kit is that I totally set up shop right on my bed! That’s right, I was going to use this time to get caught up on my DVR’ed shows. So I grabbed my laptop desk, a few cotton squares, and the entire kit and settled in. After pushing back your cuticles and washing your hands, use the cleanser before getting started. Oh, and file your nails!!! 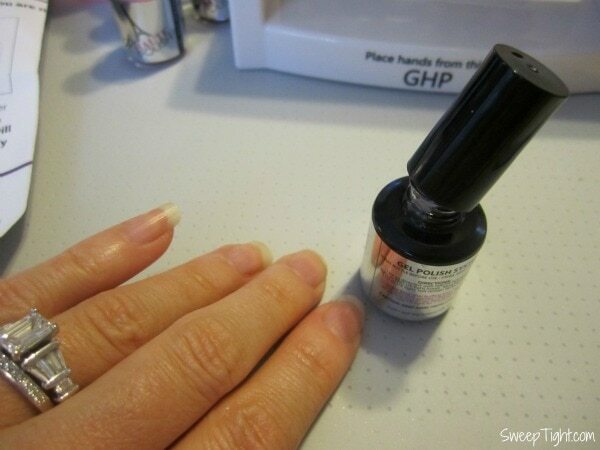 Apply a thin layer of base coat to four of your nails. You do four fingers on each hand and then both thumbs. That way everything gets under the lamps evenly. Also, really make sure you do everything in thin layers. I think I may have overdid it a little. Next time I will definitely use less. Press the button on the lamp unit and it will automatically turn off in two minutes. I was so happy that I didn’t have to time it myself! Like I said I was using this time to watch TV, so I love that this was basically a mindless activity! The kit included a pale pink color. I was also sent a deeper red, and other colors are available through the website. Although this pink is very light, I am happy with it. Since I didn’t take the time to cut and/or file my nails (still kicking myself), a less flashy color is perfect for me right now! Okay, I cannot tell you how impressed I was with the finished product! After completing all the steps, you are left with a solid coating of beautiful, shiny polish. There is no sticky or tacky feeling like with typical polish. Right after the last step you are just ready to go! They actually feel like they were done in a salon. These babies will not chip. If you are a picker they could possibly peel, but they do not feel like they would chip on there own for a very long time. My nails also felt so much stronger. It’s like a pretty protective shield. I am in love! I have not yet removed this polish, but there are clear instructions on how to do so, as well. 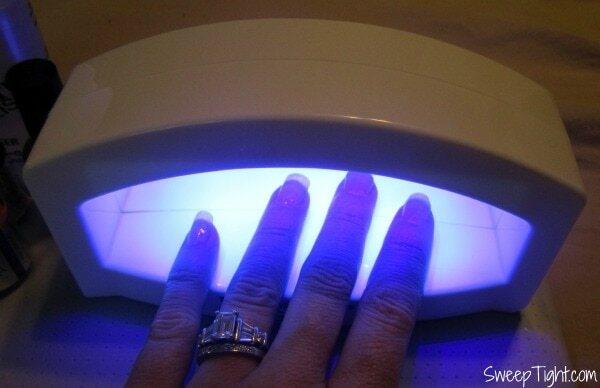 This is such a neat product and great for anyone that enjoys having gorgeous nails done from home. Sure, this takes a little more time than traditional polish, but not nearly as much as making an appointment and going to a salon. Do what I did and plop down in front of the TV. Or have a girls’ night! Whatever you choose, at $69 I think this is a great buy. I like that it lasts up to 3 weeks. I like that there are so many colors to choose from since I’d only seen a limited number of gel polishes at the salon. I don’t see the 96 shades. I’ve looked at multiple web sites and have only seen about 12.